When you start gathering ideas for your wedding rentals, you’re likely imagining your venue full of chairs and tables, maybe even a dance floor. 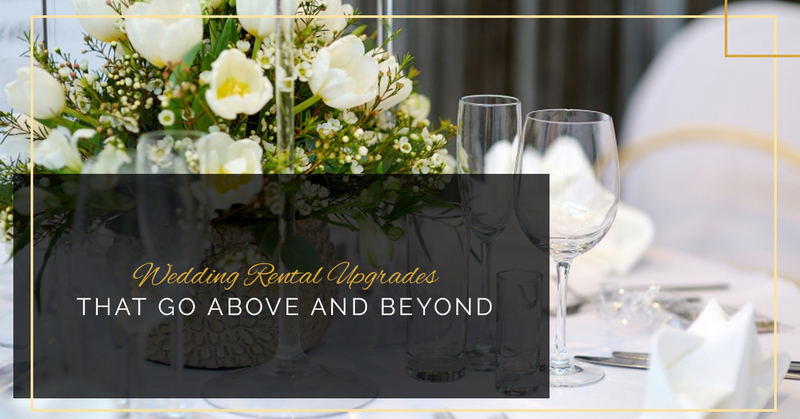 While the newlyweds should be the star of the show, that doesn’t mean the wedding a whole can’t be heightened by springing for wedding rentals that are above just basic chairs and tables. In today’s blog, we are going to show you two options for wedding rentals: a bare minimum and an upgraded version. This will help you decide where your budget allows for some extra spending! If you are having a super casual wedding or would rather allocate your budget elsewhere, you can get these super affordable white folding chairs. They get the job done! If you’re looking for a slighter nicer version of a basic folding chair, these gorgeous white padded chair rentals are perfect. Made of painted white hardwood and quality padding, these seats are perfect for the ceremony as well as the reception. For a major upgrade, consider our chiavari chair rentals. Also called Tiffany chairs, these beautifully crafted chair rentals are perfect for a classy indoor or outdoor wedding. We offer them in several metallic colors with padded bases. Most couples do not think to get special chairs for themselves and end up sitting in whatever chairs their guests are sitting in. This is, of course, fine. Especially since the couple will likely spend lots of time dancing and mingling, however, there is a nicer option if you want it! But of course, if you are a bride or groom, then you are the queen or king of the day, so why not sit in a chair made for royalty? We offer two super fun throne rentals for weddings so you can sit in style. Not only is this the most comfortable option, but it also looks amazing in pictures and sets you apart from your guests (it’s your party, after all!). Check out our throne loveseat rental and our throne chair rental. We offer frame tent rentals in various sizes to fit the needs of your wedding. These wedding tents are white and relatively plain, with no added embellishments. As we’ve said before, they get the job done by providing coverage from rain and sun so you and your guests stay comfortable. Pole tents are the best of the best when it comes to wedding tent rentals. These beautiful white tents have scalloped edges and high peaks for a truly magical experience. They also feature fabric draping around the external poles, which looks absolutely spectacular when it is illuminated by lights inside of the tent. This is the type of wedding canopy that most people imagine when they think of a garden wedding, so make sure to spring for this one if you are using your tent as part of your atmosphere, rather than just to provide weather coverage. We have pole tent rentals with one, two, or three peaks based on the size of the tent, so you can get this look whether you are having a small, intimate wedding or a huge bash with all of your family and friends. Whether you are in Fredericksburg or the DC area, we would love to make your wedding dreams come true. When you rent a tent with us, you can count on our crew showing up on time to set the tent up securely and safely for you and your guests. You can also expect our rentals to be clean, free of stains and imperfections, and exactly what you are looking for. We want to work with your budget and dreams, which is why whether you are choosing a basic option or an upgraded one, you are going to get beautiful and quality equipment every time. Add your favorite items to your wishlist to get started planning and do not hesitate to reach out to us if you have any questions about our wedding rentals!